If there is any justice, these revelations by longtime general manager Jerry Angelo will lead to an investigation and the firing of Roger Goodell. Former Chicago Bears General Manager Jerry Angelo was once best known for creating a defense so mighty that it could drag their utterly inept quarterback Rex Grossman to the Super Bowl. Now, if there is any justice, he will be remembered for something far more important. He will be known as a brave whistleblower who came forward to say that in his thirty-year career, he saw the NFL cover up “hundreds and hundreds” of cases of domestic violence. If the sports media are still paying attention to the whole “domestic violence/NFL thing”—unless we’ve moved on to something far more important like college players selling autographs (where’s my fainting couch? )—this should be banner front-page news. It’s sad but not unsurprising that Angelo did not stick to his observations. The Bears immediately disavowed everything Angelo confessed. Fomer Bears coach Mike Ditka called Angelo’s comments “gutless,” saying, “If you didn’t do anything while you were running the team, then shut up. Don’t live in the past.” This was a curious statement from Ditka, whose past comments about women, the Washington team name and pretty much any progressive idea since the end of prohibition show him to be proudly living in the past. I think Jerry was telling the truth as he believed it and then was pressured to say otherwise. I see Ditka’s unhinged reaction, if anything, as another clue that Angelo is telling the truth. I also believe Angelo because of what we do know about domestic violence, above all else. As my friend Kerry who works as a DV counselor says to me, “Rule One: Never trust the numbers.” We have seen stats that show domestic violence among NFL families is lower than in the broader society. What would happen to those stats if we included these “hundreds and hundreds” of cases? It’s not just the NFL where DV statistics are largely useless. Wealthy families don’t come forward because they fear scandal. Poor people don’t come forward because they fear court costs, the police and the breaking up of their families. Women and, to a far statistically lesser extent, men don’t come forward because of some combination of fear and shame. Kids don’t come forward because the foster care system may seem more terrifying than what they are facing at home. Violence inside the family is ugly, complex, sometimes salvageable, often irredeemable, and far more widespread than anyone wants to admit. Then let’s look at the NFL. We already know that the league has spent decades ignoring or covering up domestic violence cases. We already know that Roger Goodell, a k a Commissioner Kipling, a k a Dr. Discipline, has chosen to ignore almost every case that has crossed his desk over the last decade, including a murder/suicide that ended in the parking lot of one of the league’s own practice facilities. The only real question is, Just how widespread a coverup are we really talking about? What do the numbers actually look like? A cursory look at the NFL paints a picture of how bad it could be: young men, a lot of testosterone, a lot of what some players call “road beef” to be had between games, a lot of alcohol to dull the aches and pains, a lot of headaches and migraines, a lot of insecurity from non-guaranteed contracts and then a lot of tension when you return home to a family routine after living that life. All done in the service of a sport whose ultimate goal is expressing power over someone’s powerlessness. Police officers, who also live work lives of tension, violence, testosterone and expressing power and violence over others, have high rates of domestic violence as well. This is not coincidence. It’s a commonality of ingredients. It’s like a master list of #dv triggers. “Hundreds and hundreds” implies that domestic violence swirls around every team of which Angelo was a part. “Hundreds and hundreds” implies that it was normalized as just a feature in the lives of many players. “Hundreds and hundreds” implies, as Angelo says himself, that “our business is to win games” and all else be damned. 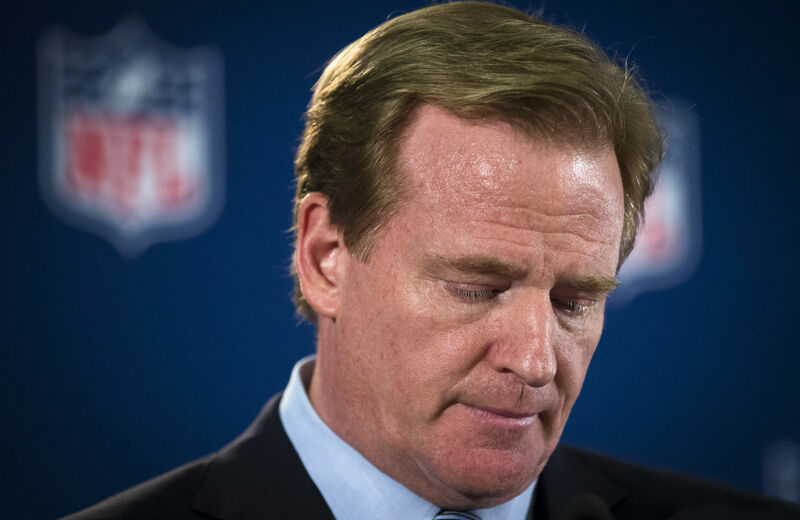 Angelo also says, “The commissioner’s job is to make sure the credibility of the National Football League is held in the highest esteem.” If that is the case, then it is a mind-blowing mystery just how Roger Goodell is still employed. His predecessor, Paul Tagliabue, did not address domestic violence because he believed that the NFL was a business and a player’s private life was their own. If the courts said something he would act, but otherwise it was not his problem. Agree or disagree with this approach, at least this was an actual approach. Roger Goodell decided eight years ago that he would crawl inside the personal and private lives of players to root out those who would shame “the shield.” Yet for some reason, while wearing brightly colored sox or smoking weed brought down the Goodell’s hammer of judgment, physically assaulting women was nakedly ignored. By the very standard Roger Goodell himself chose to set for this league, he is worse than Ray Rice. Worse than Adrian Peterson. Worse than every player he has chosen to drag in front of the cameras to represent what is wrong with the league. Worse because, unlike so many cases of domestic violence, Goodell’s actions were ones of premeditation. Paul Tagliabue was the guy who believed that what happened off the field wasn’t the NFL’s business. Roger Goodell is the guy who deprioritized domestic violence as an issue and chose to ignore it every time it happened and happened again. Save for one Atlantic City video, he’d still be ignoring it today. Not only should Roger Goodell not have a job. He should—at least morally—be seen as an accessory to the black eyes, sprained wrists and broken families that the NFL has left in its wake.